Center for Scientific Publication is a website that host all academic journals published by department, faculty, research center, or academic community within Institut Teknologi Sepuluh Nopember (ITS). This website is meant as a media to communicate between researchers and publish recent result of advance researches. Please contact us for order or further information at: email: ppublikasi.ilmiah@gmail.com. Editorial Office Address: Research Center Building 5th floor, ITS campus, Sukolilo, Surabaya 60111, Indonesia. IPTEK The Journal of Engineering (E-ISSN: 2337-8557) is an academic journal on the issued related to engineering and technology. Published actually in April, August, and December. It is open to all scientist, researchers, education practitioners, and other scholars. Therefore this journal welcomes various topics that have received by Professors and Doctors specifying related studies, and they come from reputable universities all over Indonesia and universities abroad. Please contact us for order or further information at: email: iptekjournal[at]gmail.com or mjliptek[at]its.ac.id Fax/Telp: 031 5992945. Editorial Office Address: Pusat Riset Building 6th floor, ITS campus, Sukolilo, Surabaya 60111, Indonesia. IPTEK Jounal of Science (E-ISSN: 2337-8530) is an academic journal on the issued related to natural science, mathematics, and statistics. Published actually in March, June, September, and December. It is open to all scientist, researchers, education practitioners, and other scholar. Therefore this journal welcomes to various topics that have recieved by Proffesors and Doctors specifying on related studies, and they come from reputable universities all over Indonesia and universities abroad. Please contact us for order or further information at: email: iptekjournal@gmail.com or mjliptek@its.ac.id Fax/Telp: 031 5992945 Editorial Office Address: LPPM Baru ITS Building 3rd floor, ITS campus, Sukolilo, Surabaya 60111, Indonesia. PTEK Journal of Proceedings Series publishes is a journal that contains research work presented in conferences organized by Institut Teknologi Sepuluh Nopember. ISSN: 2354-6026. The First publication in 2013 year from all of full paper in International Conference on Aplied Technology, Science, and Art (APTECS). It publish one time a year after the held of APTECS event. The Template for IPTEK Journal of Proceedings Series could be downloaded here. IPTEK Journal of Proceeding Series is a journal containing research results presented at a conference organized by the Institut Teknologi Sepuluh Nopember. We would like to invite you to contribute in the research results presented at the conference for publication in IPTEK Journal of Proceeding Series. SEWAGATI (e-ISSN: 2613-9960) adalah jurnal bagi publikasi para praktisi lapangan dan hasil pengabdian kepada masyarakat. Jurnal SEWAGATI terbit 3 kali dalam setahun, pada bulan April, Agustus dan Desember. Jurnal Limits: Journal of Mathematics and Its Applications terbit dua kali dalam setahun, pada bulan Mei dan November. Jurnal Limits terbit pertama kali (vol. 1 no. 1) pada tahun 2004 masih dalam versi cetak, tahun 2016 vol. 13 no. 2 sudah tersedia versi online dan semua proses sudah dilakukan secara online. Jurnal Aplikasi Teknik Sipil (JATS) E-ISSN 2579-891X, memuat tulisan tentang aplikasi dibidang Teknik Sipil. Aplikasi ini boleh berasal dari semua cabang ilmu teknik sipil baik itu struktural, geoteknik, manajemen konstruksi, hidrologi, transportasi, dan informatika teknik sipil. Sehingga aplikasi ini tidak hanya mengenai urusan pembangunan sebuah proyek bangunan, tetapi juga memungkinkan untuk memodelisasi sebuah bentuk dengan bantuan software. 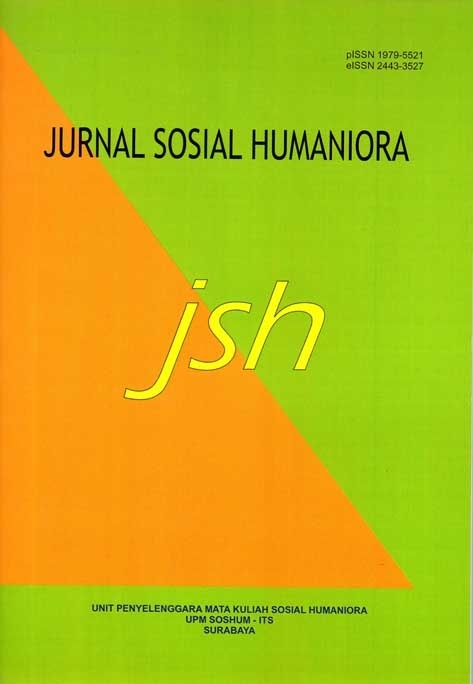 Jurnal Sosial Humaniora (JSH) is published by LPPM-Institut Teknologi Sepuluh Nopember with its main aim to spread critical and original analysis from researchers and academic practitioners on various contemporary social and humanities issues both local and foreign. The writing is published after undergoing a peer-review process by providing an exclusive analysis of social and humanities issues from various perspectives. JSH provides high-quality study outcomes and new thoughts for academic practitioners, researchers and decision-makers to break down the complexity and dynamics of contemporary social changes. Published two times a year: January - July and August - December, JSH provides itself as a medium for – also invites- researcher, academic practitioners, and intellectuals to submit their critical writings and to contribute to the development of social and humanities sciences. The journal is published biannual in February and August by the Department of Geomatics Engineering, Institut Teknologi Sepuluh Nopember (ITS). It is open access to all scientist, researchers, student and other scholars. The goal of this journal is to provide a platform for scientists and academicians to promote, share, exchange and discuss various issues and developments in different areas of Geodesy and Geomatics. We receive manuscripts from reputable universities all over Indonesia, universities abroad and other government and private institutes. All manuscript must be prepared either in English or in Indonesia and are subject to a fair peer-review process. Editorial Office Address: GM building, Teknik Geomatika, ITS campus, Sukolilo, Surabaya 60111, Indonesia. (IJCSAM) International Journal of Computing Science and Applied Mathematics is an open access journal publishing advanced results in the fields of computations, science and applied mathematics, as mentioned explicitly in the scope of the journal. The journal is geared towards dissemination of original research and practical contributions by both scientists and engineers, from both academia and industry. This journal is published two times in a year. (IJCSAM) International Journal of Computing Science and Applied Mathematics is a journal published by Lembaga Penelitian dan Pengabdian Kepada Masyarakat (LPPM) Institut Teknologi Sepuluh Nopember, Surabaya, Indonesia. International Journal of Marine Engineering Innovation and Research (IJMEIR) is an open access journal, which means that visitors all over the world could publish, read, download, cite and distribute papers published in this journal for free of charge. IJMEIR is published by Department of Marine Engineering, Institut Teknologi Sepuluh Nopember, Surabaya Indonesia and supported by IMarEST Indonesia Branch. IJMEIR journal has a vast group of visitors, a far-reaching impact and pretty high citation. IJMEIR adopt peer-review model, which insured fast publishing and convenient submission. IJMEIR now cordially inviting you to contribute or recommend quality papers to us. Theses, dissertations, research papers, and reviews associated with all aspects of the marine engineering, sciences and technology are all acceptable for publication. Interested in submitting paper to this journal? IJMEIR recommend that you review the About the Journal page for the journal's section policies, as well as the Author Guidelines. Authors need to register with the journal prior to submitting or, if already registered, can simply log in and begin the six-step process. Template of manuscript could be downloaded in microsoft word here. IJMEIR published issue in March, June, September and December per year. Jurnal GEOSAINTEK adalah jurnal yang dikelola oleh Lembaga Penelitian dan Pengabdian Kepada Masyarakat (LPPM) ITS dan Departemen Teknik Geofisika ITS. Terbit pada bulan Januari-April, Mei-Agustus, dan Septermber-Desember pada setip tahunnya. Jurnal Geosaintek mempublikasi dan menerbitkan hasil kajian, penelitian, penerapan ilmu pengetahuan serta teknologi di bidang kebumian. Terbuka bagi peneliti, praktisi, serta akademisi dari berbagai lembaga. Jurnal GEOSAINTEK terbit dalam versi cetak dan online. Journal of Infrastructre & Facility Asset Management is aimed to develop Infrastructure & Facility Asset Management Sciences, knowledge in Indonesia. This journal accepts paper contains the results of research or knowledge development in Infrastructure & Facility Asset Management from anywhere. This journal is published regularly 2 times a year, every March and September. If needed, this journal can also be published in June and December as Supplement Issue. Supplements are not of mandatory publishing. Supplements are only issued if deemed necessary. Papers is limited to 8-16 pages. Jurnal Manajemen Aset Infrastruktur & Fasilitas ditujukan untuk mengembangkan Ilmu Pengetahuan Manajemen Aset Infrastruktur & Fasilitas di Indonesia. Jurnal ini menerima tulisan yang berisikan hasil penelitian atau pengembangan pengetahuan Manajemen Aset Infrastruktur & Fasilitas dari mana saja. Jurnal ini diterbitkan secara berkala 2 kali setahun, pada setiap bulan Maret dan September. Bila diperlukan, jurnal ini juga bisa diterbitkan pada bulan Juni dan Desember sebagai Suplemen. Suplemen bukan merupakan bagian dari penerbitan wajib. Suplemen hanya diterbitkan kalau dipandang perlu. Makalah bisa ditulis dalam Bahasa Indonesia atau Bahasa Inggris. Panjang makalah dibatasi 8-16 halaman. Jurnal Manajemen Aset Infrastruktur & Fasilitas diterbitkan oleh Institut Teknologi Sepuluh Nopember (ITS) bersama dengan Kementerian Pekerjaan Umum dan Perumahan Rakyat (KemenPUPR). JMAIF menjadi mitra : Program S2 MAI ITS, UNIID. International Journal of Statistics and Data Science (IJOSDS) is an open access journal publishing advanced results in the fields of statistics and data science, as mentioned explicitly in the scope of the journal. The journal is geared towards dissemination of original research and practical contributions by both scientists and engineers, from both academia and industry. All submitted manuscripts are checked first by the Editor-in-chief whether the manuscript falls under the scope of the journal. If the manuscript fits within the scope, then the formal peer review process is conducted by the editorial board members. The authors and reviewers are encouraged to use the electronic submission and peer review system. Journal of architecture&ENVIRONMENT or JoAE (E-ISSN: 2355-262X) is a biannual publication (April and October), published by the Department of Architecture, Faculty of Architecture, Design, and Planning, Institut Teknologi Sepuluh Nopember. It aims to communicate, disseminate and exchange information from studies in architecture and its interactions with the environment. Journal of Civil Engineering merupakan jurnal bidang teknik sipil yang mengacu pada sistem standar internasional dalam pengelolaannya dengan tujuan utama memajukan bidang teknik sipil melalui publikasi ilmiah demi terwujudnya kemudahan mendapatkan ilmu dan informasi serta mendukung kemajuan teknologi. Journal of Civil Engineering merupakan sebuah Jurnal Ilmiah yang disempurnakan dengan perbaikan dan perubahan dari jurnal pendahulunya yaitu Jurnal TORSI. Jurnal TORSI telah terbit Sejak tahun 1981 tepatnya pada bulan Maret. ITS Journal of Civil Engineering menerbitkan lima buah naskah penulis terpilih dalam setiap kali penerbitannya. Setiap Naskah telah melalui proses Standarisasi oleh Redaksi untuk kemudian dilakukan peninjauan oleh Anggota Tim Reviewer Ahli. Bilamana hasil peninjauan mengharuskan Penulis untuk melakukan revisi, maka harus direvisi terlebih dahulu. Proses panjang tersebut diharapkan mampu menyaring Naskah hingga layak untuk diterbitkan. Journal of Civil Engineering terbit dua kali dalam satu volume. Periode terbit Januari - Mei dan Periode terbit Juli-Nopember. Korespondensi akan dilakukan melalui email resmi journal-services@ce.its.ac.id atau journal.services@gmail.com. Proses naskah dilakukan melalui portal OJS. Journal of Civil Engineering is Indexed by Google Scholar. To submit an article, you need to register first. Please click register in the menus above.